Unfortunately for the cigar smoker, some life insurance companies do not distinguish between someone who smokes the occasional cigar and someone else who smokes a couple of packs of cigarettes every single day! So, as a stogie smoker it makes sense to find a life insurance company which differentiates between “the occasional cigar” and “40 cigarettes per day”. 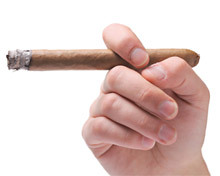 Nevertheless, Banner Life Insurance also has a provision for a single cigar per month, for what that’s worth. There’s a requirement to undergo a urine test which must prove negative for nicotine. The best you can get with Prudential is the Preferred insurance option, which is the second best rating. Nevertheless, on average, that’s far better than almost all other term life insurance underwriters will offer to a cigar smoker, no matter how occasional the pastime is. Enjoy a cigar once in a while? Get your own life insurance quote! It is possible to achieve the very best rating (Preferred Plus) providing you smoke no more than a single cigar each week. This would be classed as a non-smoking rate, termed as Preferred Plus Non Tobacco. The best way to find life insurance companies that offer the Preferred Plus option is to use a broker through an independent agent. There are very few of them though, so it’s probably going to take some digging. Prudential have a special class for cigar (and cigarette) smokers. It is called “Non Smoker Plus” and allows a smoker to consume as much as they want and also test positive for nicotine with the urine test. Do keep in mind that along with Prudential’s offer of a “smoke as much as you like, we don’t care” policy, their Non Smoker Plus rates are not as attractive as other smoker-friendly companies. Nevertheless, this could very well be the best option for many people who prefer to indulge in more than a single cigar once each week. Do You Smoke cigars? Get your own life insurance rates here!